Los Roques has the most amazing beaches for kite surfing. With strong trade winds and flat waters, the weather conditions of Los Roques are perfect for kite surfing. 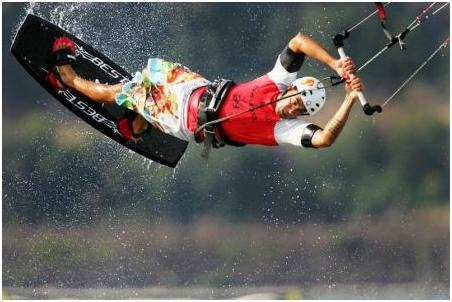 It has great kite surfing facilities which offer kite surfing lessons, equipment, and guides. Because of the large number of islands of the archipelago, kite surfers can enjoy a variety of different conditions and surf at the island that best meets their needs. From beginners to experienced kite surfers, Los Roques is the ultimate destination to experience the exhilarating sport of kite surfing. Dare2Fly is a great facility which has highly trained and experienced instructors (IKO certified) who can get you kite surfing in no time. Dare2Fly also has the entire range of the exclusive Cabrinha switchblades. Dqare2Fly kite school can be found on the beautiful island of Francisqui which can be reached easily by renting a boat from Gran Roque which is the main hub of activity at Los Roques. Once you get there, you can take boat taxis to your favorite kite surfing locations or explore all the islands until you find the perfect spot. Francisqui has gained the reputation of being the best destination for kite surfing. It is just fifteen minutes away from Gran Roque which makes it easily accessible. You can hire a boat taxi to get to this lovely island. Kite surfers can enjoy great conditions for kite surfing in this area as the waves reach a height of fifty meters to one hundred and fifty meters. This is one of the main reasons why it draws experienced kite surfers in hordes. You can easily rent equipment form Dare2Fly for an amazing day of kite surfing. You can also avail the option of kite-only hours. Try to make your bookings in advance as the equipment available for rent is in limited numbers. Many packages are all-inclusive, meaning you donÔÇÖt have to pay additionally for kite surfing lessons or for renting kite surfing equipment. If your package does not include kite surfing, try to get as early as possible to Francisqui to ensure that you get the required equipment. Many experienced guides are also available to help you out. If you are planning to bring your own equipment along with you, make sure that you inform the airline beforehand as the storage space is limited.